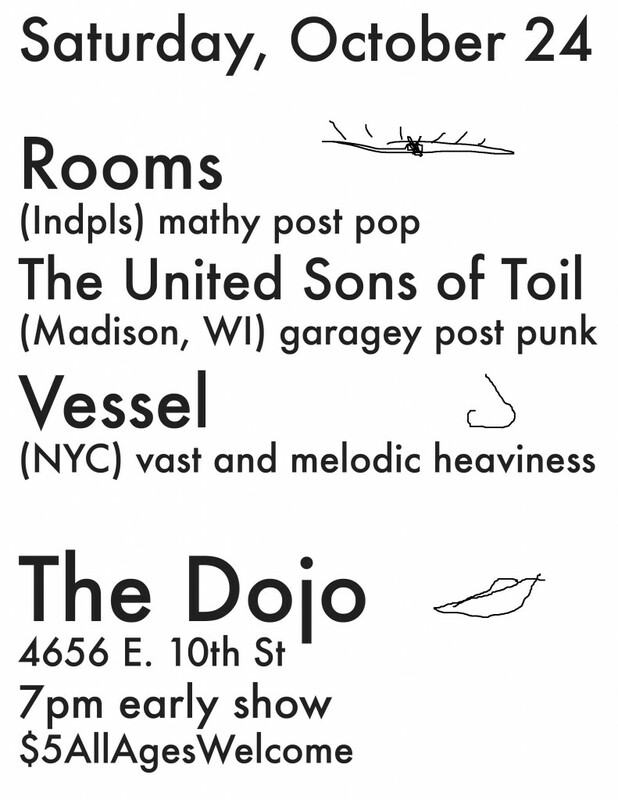 thanks to lazy complaints, Rooms and some good friends & family will be rocking it all ages at the Dojo on E 10th st., right next to the Emerson theatre. diy style, the same way we all got started playing. if there is one show the over21ers should go to its this one, and if you under-agers want to know what you’re missing at the non-metal shows, you should show up and have fun, not mosh, and buy some cds that may just flip your script. Vessel are an expansive and melodic band from the true NYC and sound like an urban landscape you see while listening to music on headphones with the Deftones in the left ear and Mogwai in the right. The United Sons of Toil are the kind of slightly minimalist garagey punk that shows that the power of good riffage can cause ones mind to expand as well as their political beliefs. You are currently browsing the Rooms News blog archives for October, 2009.